A version of this article first appeared in The Valley Advocate, and was subsequently the subject of an op-ed in the Washington Post. At shortly past five o’clock in the morning, a team of 12 Ludlow officers — amounting to more than a quarter of the town’s entire police force — arrived at the house of a suspected drug dealer. Like most SWAT teams in the country, Ludlow’s is part time, with officers splitting their duties between SRT and patrol. Since SRT is rarely used — in over a decade it has been activated an average of just once or twice per year — tactical officers gain most of their experience through training. As recommended by the standards of the National Tactical Officer Association, each Ludlow SRT team member spends roughly 5 percent of their on-duty time, or 16 hours per month, training for tactical operations. Ludlow represents what some observers see as a disturbing trend in policing — the “militarization of Mayberry,” as Dr. Peter Kraska puts it. Dr. Kraska, a professor of criminal justice at Eastern Kentucky University and an authority on the police use of SWAT teams, has surveyed police departments across the country and estimates that the number of such tactical units in agencies serving populations under 50,000 grew from 20 percent in the 1980s to 80 percent in the mid-2000s. Based in Greenfield, the newest SWAT team in Massachusetts serves the state’s most rural county. In June 2016, Franklin County Regional Special Response Team was deemed ready to deploy after taking in more than $115,000 in homeland security grants for officers’ training and tactical gear. Since then, it has been used just once — to serve a firearm-related search warrant. Recent moves by the Trump administration may make it even easier for such agencies to stock up on tactical gear. In May 2015, then-President Obama signed an executive order leading to a ban on transferring certain types of surplus equipment to local police through a Department of Defense program known as 1033. But the changes were mostly cosmetic, cutting off access to equipment that few local police had requested to begin with: .50 caliber guns and weaponized aircraft, for example. Still, in response to pressure from the Fraternal Order of Police — the nation’s largest law enforcement labor organization — in September President Trump announced that he would rescind Obama’s order. SWAT originated in the latter part of the 1960s in response to high-profile incidents like the Watts riots and the clock tower shooter at the University of Texas, Austin. The idea was that a specially trained unit needed to be in place to address situations — like hostages, snipers, or armed barricaded suspects — that exceeded the capabilities of patrol officers. According to a review of news reports and police websites, there now appear to be at least 23 police SWAT teams operating in Massachusetts. For a small state, redundancy and overlapping services are a given. There are now seven tactical police units serving the sparsely populated western part of the state — four independent SWAT teams and two regional units, as well as the state police tactical team. Most deploy only three or four times a year, tops. (The state police team, which typically deploys between 180 and 200 times per year across the Commonwealth, is an outlier). Even greater redundancy exists in the Boston area. But they are an investigation like no other: Officers knock down doors, scream and point weapons at people, and generally create “shock and awe” conditions — as one headline in the Berkshire Eagle described a Berkshire County SRT operation. But none of it was true. Johnson had a landscaping business in Connecticut, a state where he also registered his motor vehicle and — crucially — his guns. A judge later determined that the search warrant had been improper because there was simply no evidence that the guns were “related to criminal activity.” Two years after the raid, following a court battle that cost Johnson $45,000, prosecutors dropped all charges against him. 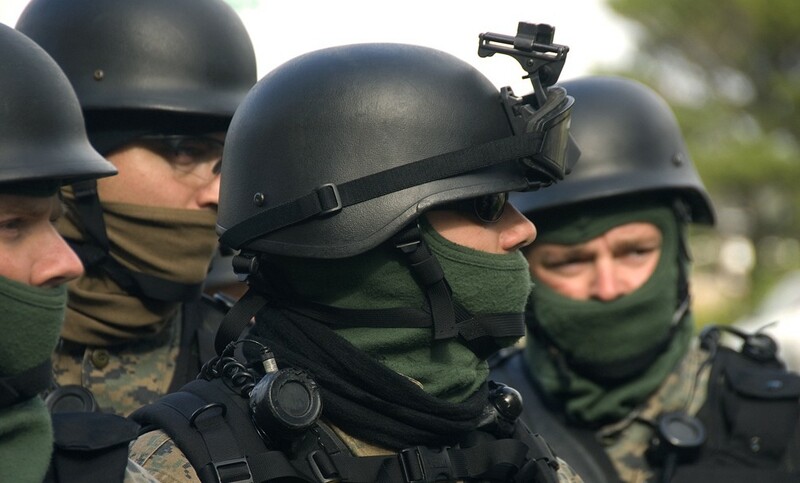 The aforementioned ACLU report, based on nearly 4,000 public records obtained from police departments across the country, found that around 80 percent of all SWAT deployments were for the purpose of executing such search warrants — usually for drugs. Records obtained and reviewed in the course of this investigation also found warrant service to be a commonplace reason for deploying small town SWAT teams in Massachusetts. In 2015, eight of nine call-outs by Berkshire County SRT were to execute “no-knock” search warrants. The same year, Westfield’s team was less busy, deploying on only two occasions — both to serve drug-related search warrants. Documents and SWAT policy manuals obtained for this investigation detail training and selection standards for small town teams in Mass. But how selective can you really be when — as is the case in Ludlow — you have to build a SWAT team and have only 40 officers to choose from? In an email, Ludlow’s Lt. Brennan said officers under his command had to meet standards for physical fitness and firearms proficiency, among other qualifications. “Some applicants have trouble with selection process, even if they are in great shape,” he wrote. According to training documents reviewed for this article, Baillargeon’s proposal got off to a good start. Following Sgt. Baillargeon’s memo, in June 2012, records show that the team trained together five times during the remainder of that year. But the initiative would also create an additional burden for a department so strapped for cash that it had previously relied on citizens’ donations and an annual charity golf tournament to shore up its 12-member Special Response Team, and the frequency of their training soon tapered off. In 2013, SRT members completed the eight-hour training goal on only five months of the year; five months of training were also recorded in 2014. By 2015, the available records show the team was able to notch only a single eight-hour training session — in March.